Love is in the air… literally! 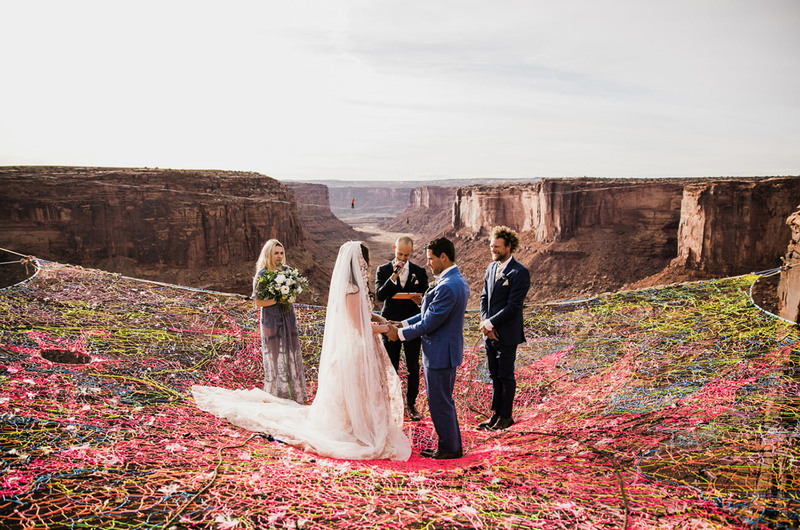 The moment we saw Kim + Ryan’s incredible *suspended* wedding on Instagram, we wanted to know all the details, and were so excited when we saw the couple had actually already submitted their day for us to share! 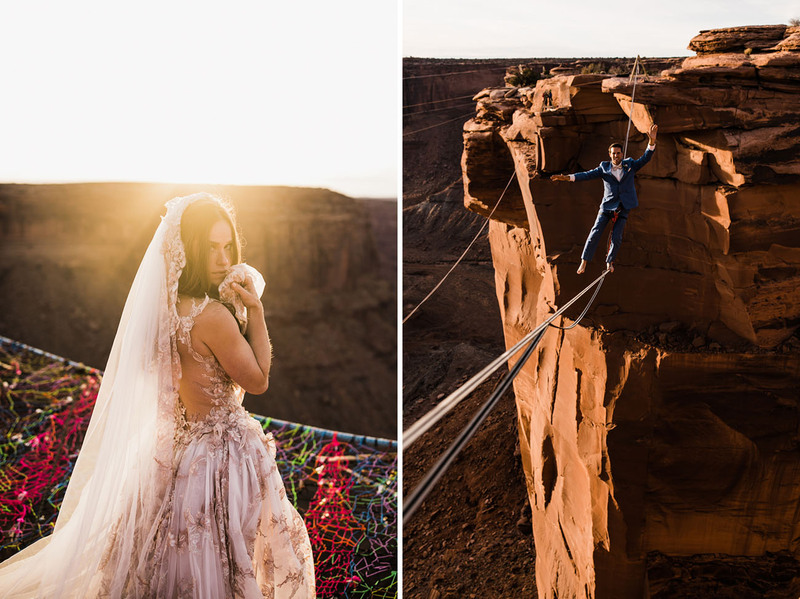 :) As professional slackliners, K+R specialize in highlining, which is a sport similar to tightrope walking… only hundreds of feet in the air (don’t worry — they wear harnesses!). 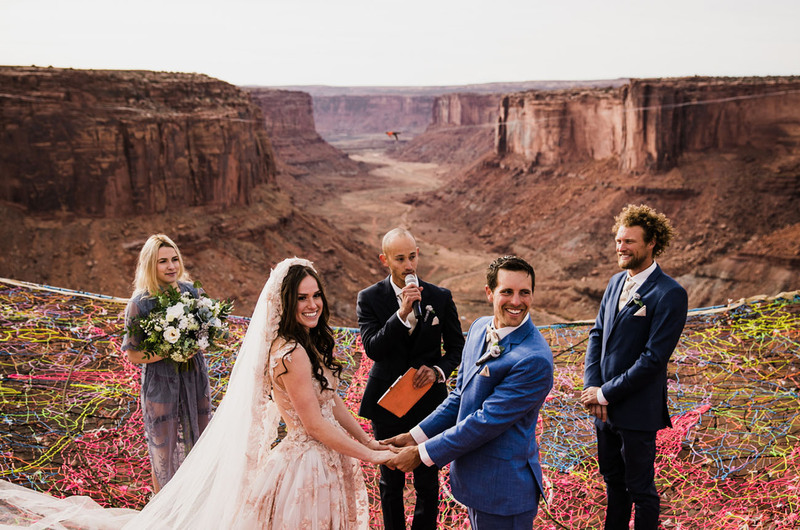 The two fell in love in Moab, Utah at a slacklining festival, and happened to get engaged there a few years later, so it only felt right to say their vows there, too! They worked closely with Andy Lewis (AKA Sketchy), Ryan’s best man, to have their ceremony on Andy’s invention: the Spacenet. 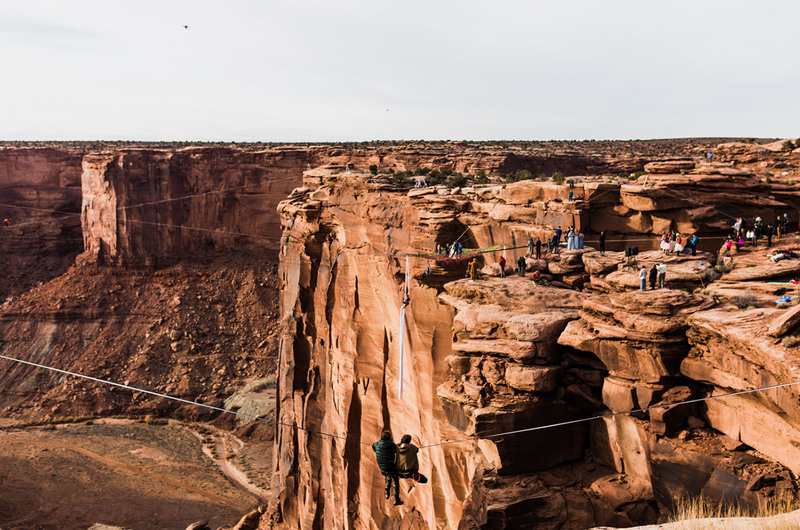 Oh, and did we mention that the Spacenet is 400 feet in the air — over the canyon?! 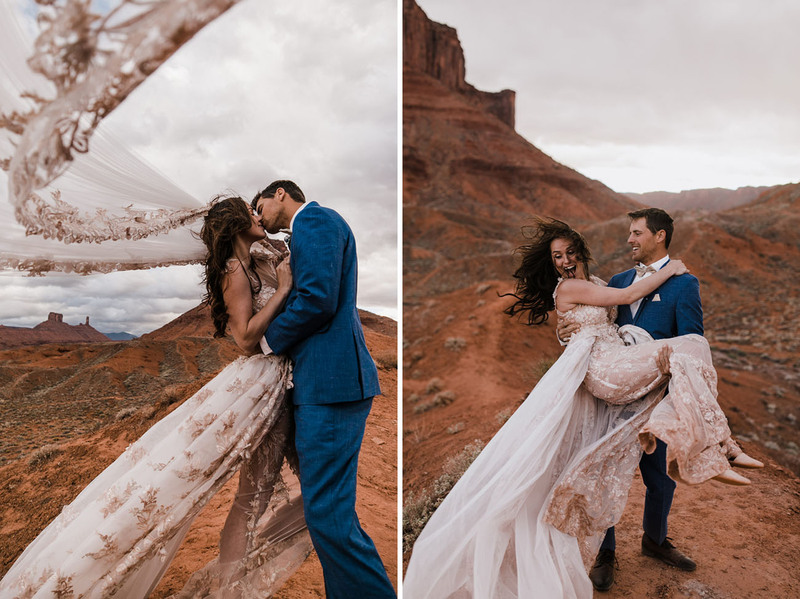 The big day was actually spread out amongst three days, to accommodate the fickle weather — a first look portrait session in the desert, a dress rehearsal on the net, and the actual wedding day. 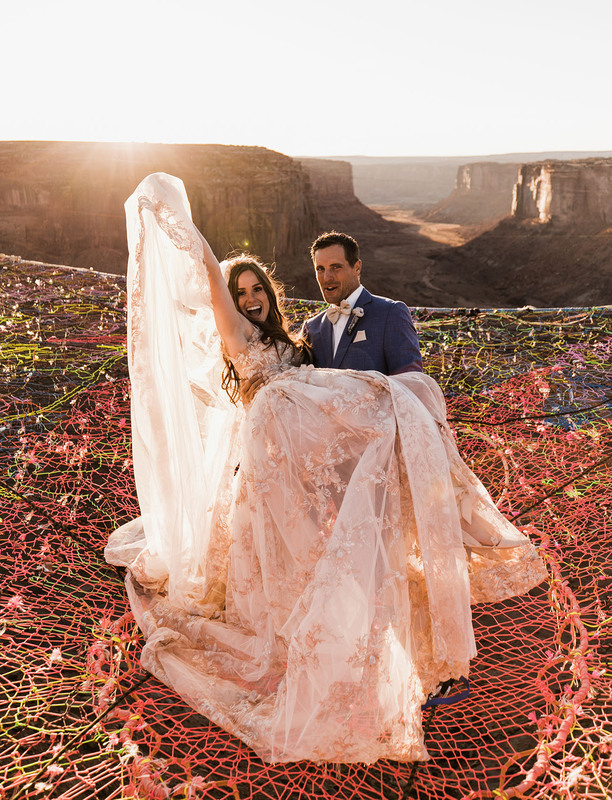 Filled with circus-like flair, their wedding was an absolute show-stopping extravaganza filled with base jumpers leaping off the sides of the canyon with 5,000 flower petals stuffer in their parachutes, aerialists hanging from silks below the net, and one glamorous Galia Lahav dress! 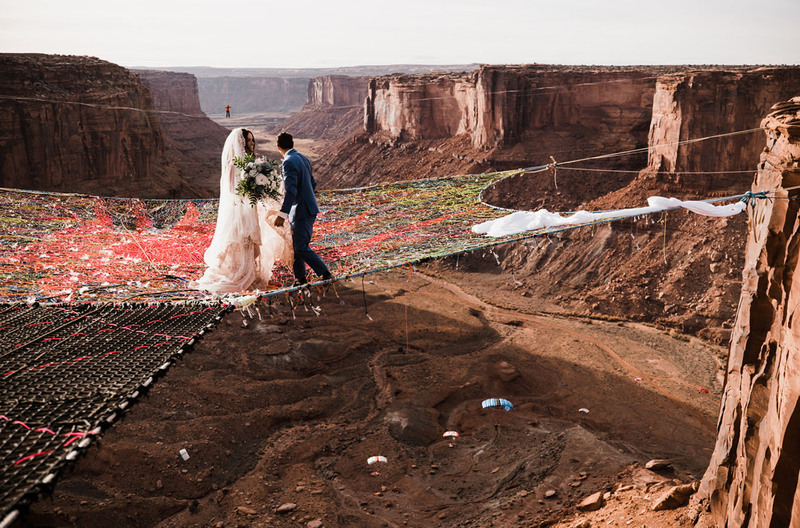 Here’s Kim with more about the inspiration behind the big day: The Fruit Bowl Highline Area in Moab has a lot of significance to us. 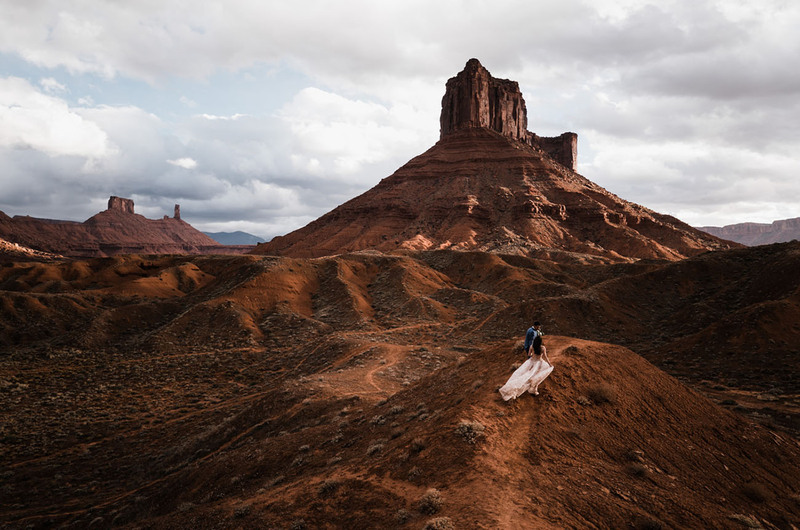 Three years ago, Ryan’s idea of a second date was to take me on a two week road trip to Yosemite, Vegas, Zion, and Arches, with a slacklining festival in Moab as the main destination. (A big road trip with someone you barely know can turn out really well or go horribly wrong… We were taking a big risk, but it definitely paid off!) We now consider this festival our anniversary. 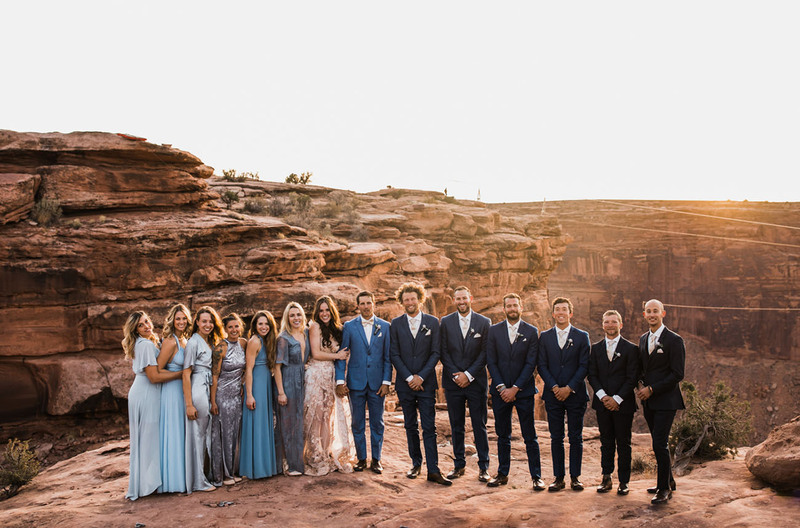 This festival is the only time of year we get to see ALL of our friends from all over the world (Europe, South America, Australia, Iceland, and Canada) all in one place, so it made sense for us to get engaged there and get married there. Not to mention, this may be one of the only destination weddings that was actually convenient for 99.9% of its guests! Now, I know you’re all curious — how did they pull it off?! 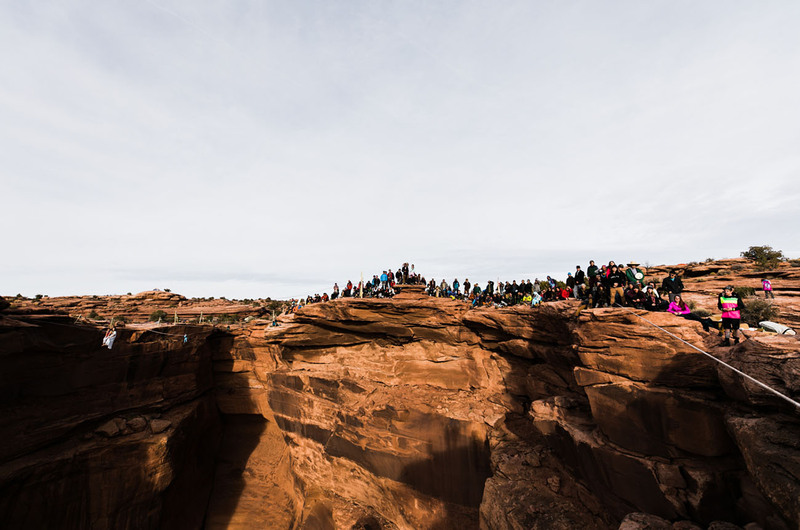 Let’s see all the details in the snaps captured by The Hearnes Adventure Photography! Kim was all about the DIY elements. 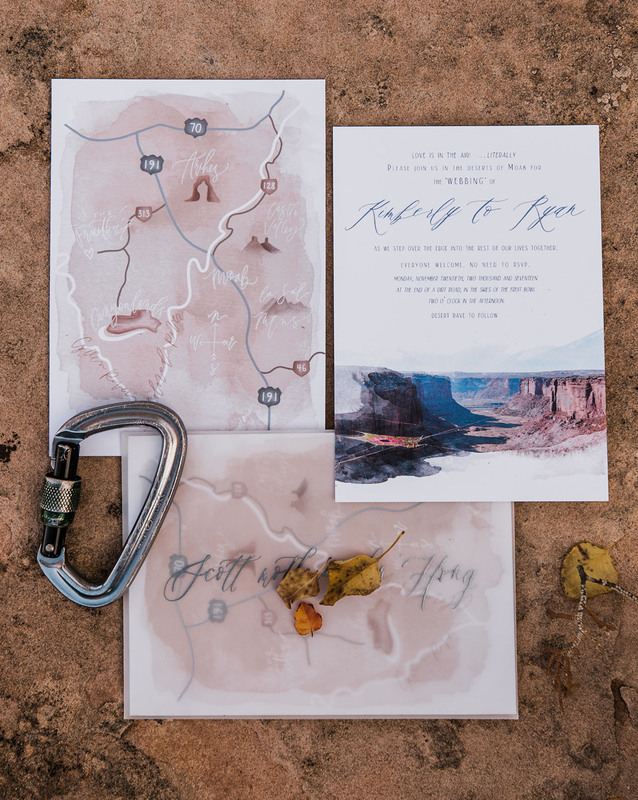 She shares: I couldn’t find any invitations that were “us,” so I made the invitation, map, and all the signage myself — all slackline and adventure-inspired, of course. 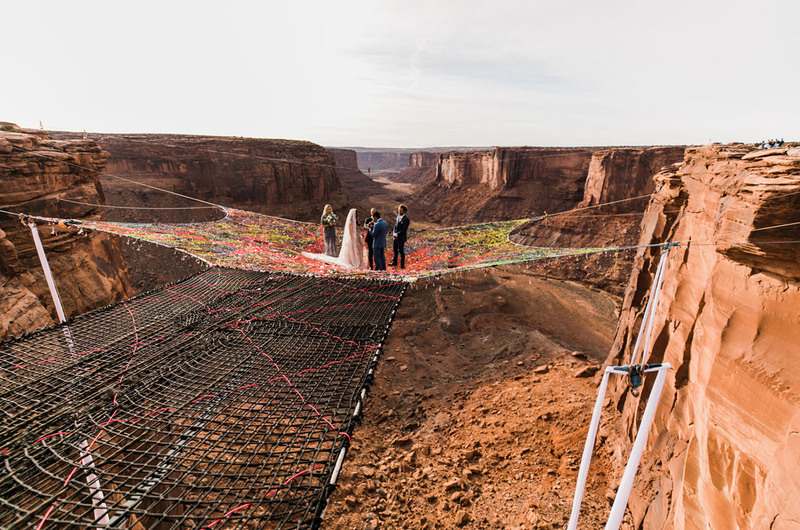 Webbing is the material that we walk on for slacklining, so instead of our wedding, I called it our “webbing” and invited everyone to that. 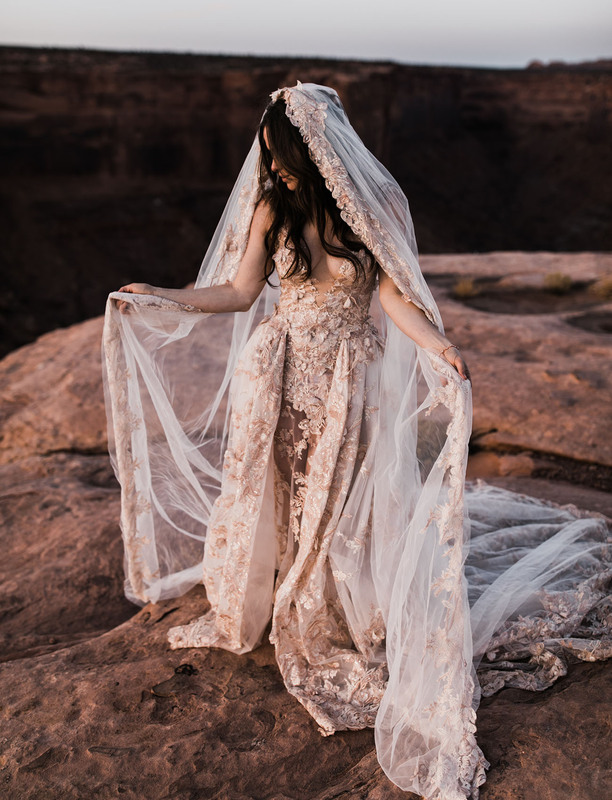 And you thought the ceremony was the only jaw-dropping thing… But that Galia Lahav dress from Kinsley James Bridal!! Admittedly, there were more than a few roadblocks K+R faced while planning this very logistically complicated wedding. And she’s spilling all the details… Starting with CELL SERVICE! Kim tells us: It’s pretty stressful to plan a wedding, but imagine not having a set venue, a set time, or cell service! 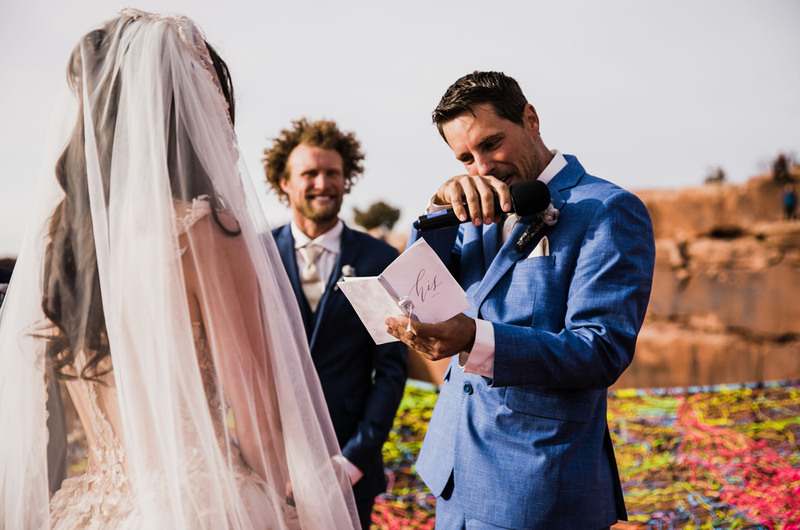 Because our wedding was in the middle of the desert and so unique to the wedding industry, a lot of it ended up being very DIY. I had quite a few, but my Dad walking me down the aisle... His attitude was so positive even though he was WAY out of his comfort zone. He's never done anything like this, and it was really special to share my world with him. He even took a nosedive walking me out there, but took it like a champ! Instead of getting embarrassed, he started laughing, and everyone cheered him on and called to him until he got back up and finished walking out onto the net. When he got there, his arms shot in the air and he was so happy with what he just accomplished! I don't know if I've ever seen him happier, and he hasn't stopped talking about that day since. A lot of people told me they started crying watching him walk me out there — seeing a father so out of his element, but wanting so badly to walk his daughter down the aisle. It was really special. Side Note: He actually walked behind me because the net isn't made for two people walking side by side next to each other, especially when one is wearing a very poofy dress. We were both tied in, but we still didn't want to risk either of us tripping and rolling off the aisle just to walk next to each other, so he helped me out by holding my dress up. 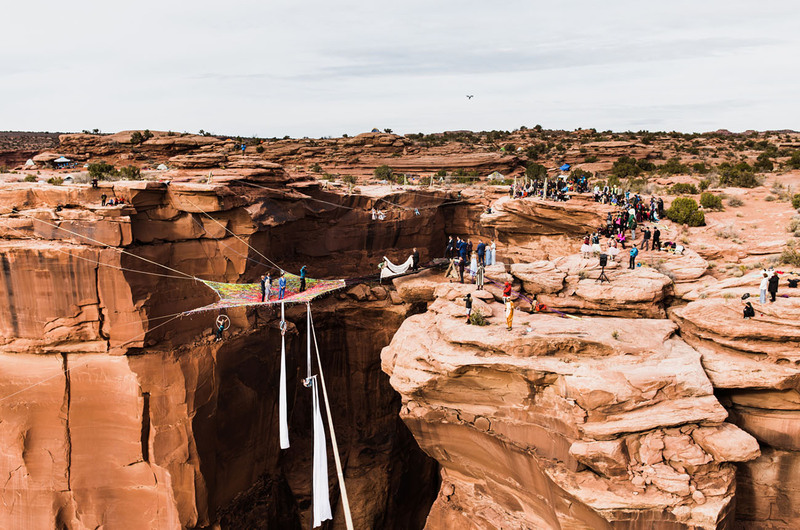 Our venue “aisle” concept had never been done before… To get out onto spacenets, people generally walk the slackline out to them or slide across the slackline (like a zipline) to get to it. We had to literally invent a “spacenet aisle,” make sure it was safe to walk on, and get it rigged closely enough to the cliff in a new location to make sure our guests can hear and see everything and the wireless microphones would work. 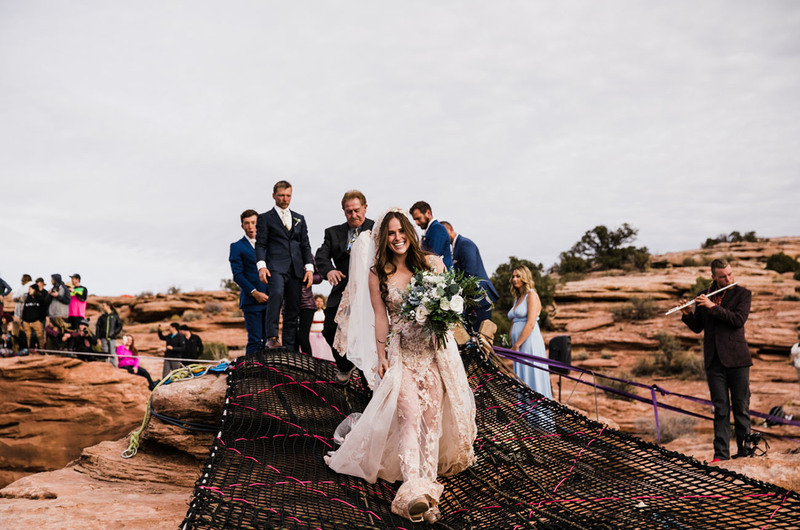 We wanted the full energy of the festival… which included our friends highlining around us, doing acrobats, making bubbles, playing music, and doing silks and lyra under us during our wedding. Luckily, we have very talented friends who were more than happy to help. 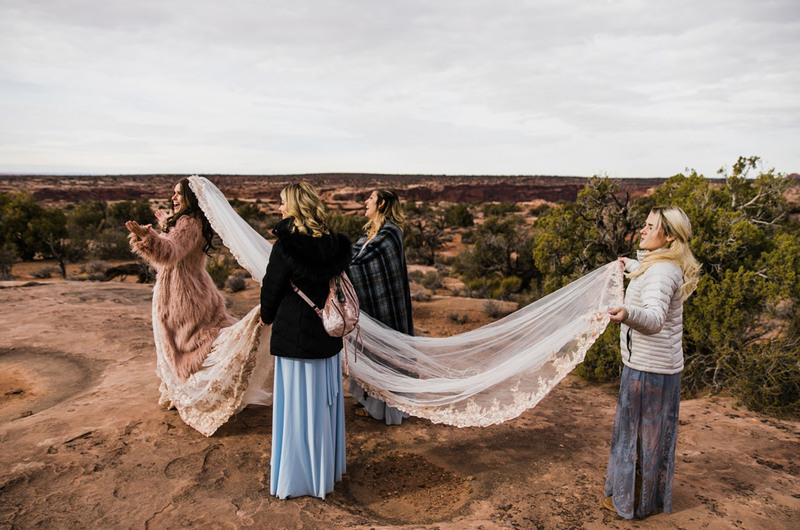 I made sure that the silkists had matching white silks and the lyra was wrapped in white tape since white seems to be the only color that stands out in that canyon. Our photographers needed to be adventurous and flexible enough to be able to deal with a weather pending date and not be afraid of getting on the net/near the cliff edges… The Fruit Bowl is also a very large area to cover with a lot going on, so we really needed someone skilled who could take on that challenge, and The Hearnes Adventure Photography definitely met the task! We dealt with some access issues… this is the 10th year of the festival, and the first time it has been a permitted event. We had been planning our wedding for about 4 months already and then got hit with a major surprise: the festival had grown so large in the past few years that the land agencies that controlled the area where the festival is held didn’t want us to do it this year at all. 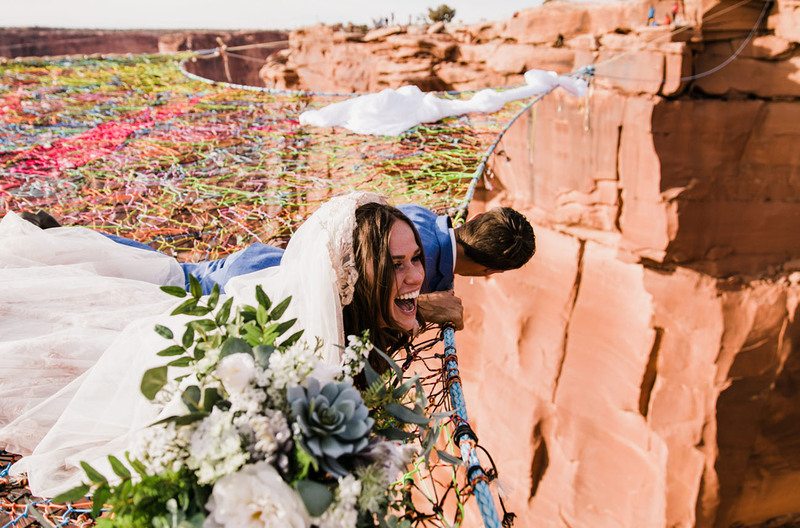 We were worried that this would ruin our plans and we’d have to completely scrap the wedding, but luckily, some really amazing slackliners in our community stepped in to help facilitate access. They worked with multiple land agencies in the area to come up with a plan for parking and bathrooms for that many people, and in the end the land agencies were extremely happy with all the positive changes. But for many months there, the planning was very uncertain and we just had to hope for the best. We ended up having the wedding a day before the festival so that we wouldn’t interfere with all the events they had planned. This way, we were able to have official bathrooms for our guests (instead of them packing everything out) and also provide shuttles to mitigate the parking on the sensitive cryptobiotic soil in the area (the two major concerns from the land agencies). OW, OW!! So that they didn’t worry about dropping their real rings, Kim crafted tiny soft shackle rings for them to exchange on the net. 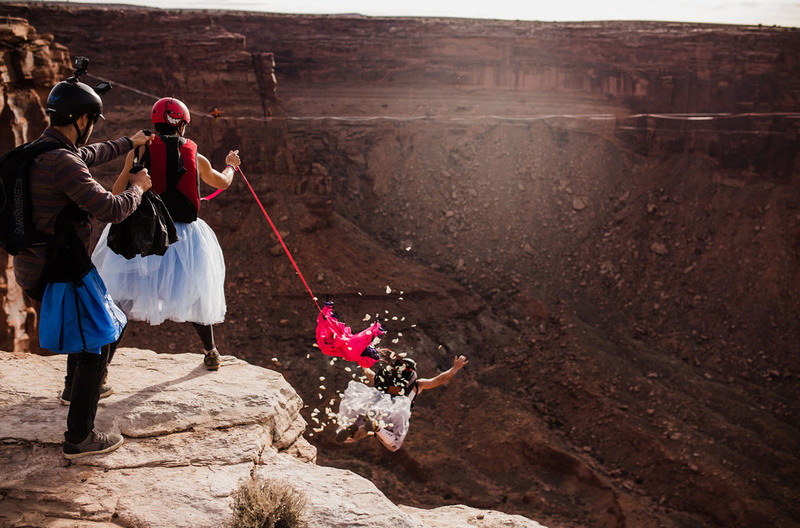 I had a fun idea to have base jumpers as flower girls, but that is a risk in itself. I didn’t want an accident to happen on our wedding day and ruin the energy, but if all went well, then it would be a risk I was glad I embraced. We really wanted to honor the spirit of the festival and everything that makes it so great. 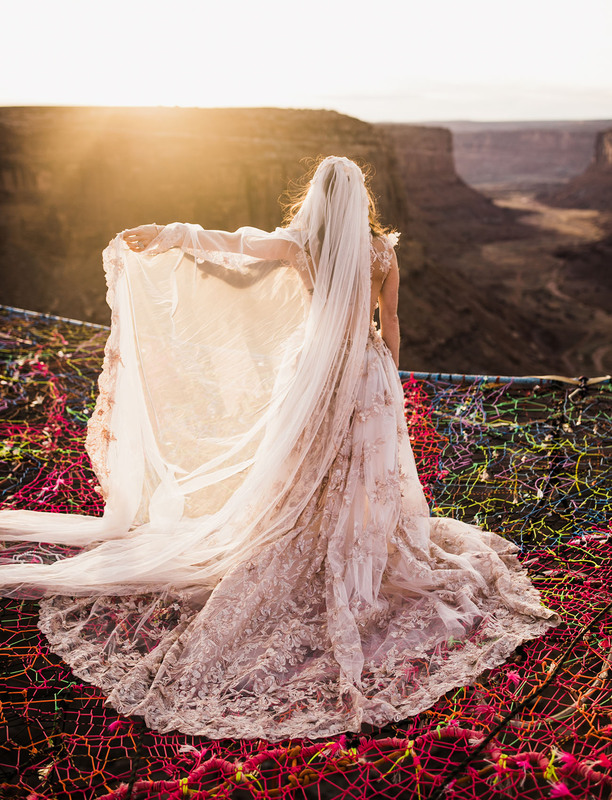 We embraced highliners, aerialists, acrobats, fire spinners, and musicians in our wedding, so to deny BASE jumpers would have gone against the true to the spirit of the festival and the theme we wanted to embrace: living life to the fullest. 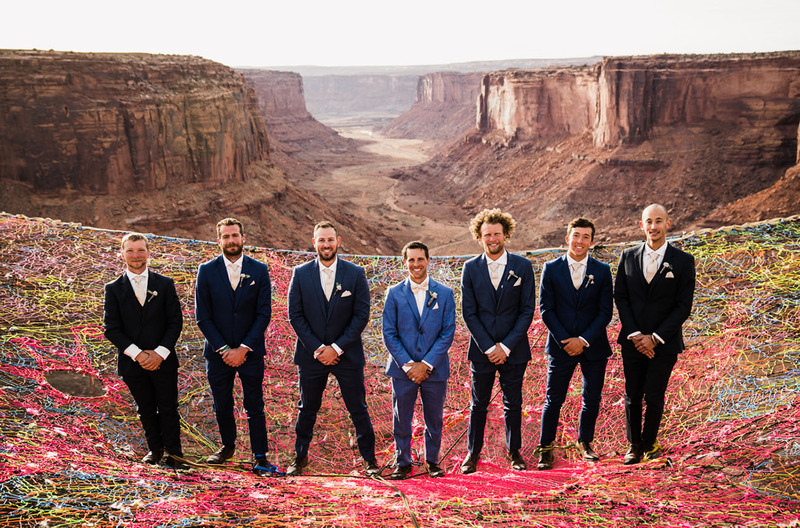 To mitigate the risks, I only asked extremely experienced BASE jumpers that know how to get out of a bad situation to be a part of the wedding. 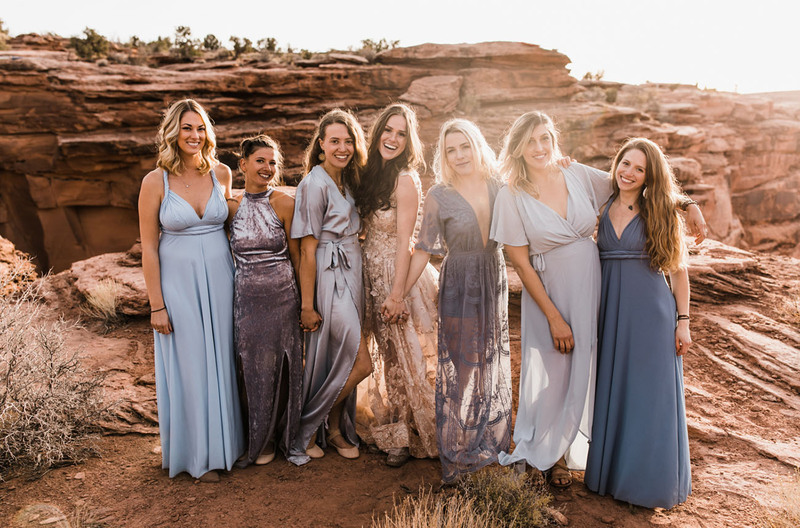 For the bridesmaids, Kim wanted to complement the orange hues of the desert, so blue tones it was! The ladies who also highline wore dresses that were easier to walk in and allowed a bit more freedom! If you have a wedding planner, be grateful for that, and just be glad you aren't planning it all yourself! If you are planning it yourself and feeling stressed, breathe and try to be grateful for these busy moments in your life because life won't always be so busy, and you'll find yourself missing it when it's gone. Enjoy the process. The planning is the foreplay for the wedding—it is what makes you so excited for your big day. Without it, you wouldn't have anything to look forward to. Be grateful to everyone helping you. Say thank you often and be glad you have a community to support you when you ask. Remember that no one has to do any of this for you, but they are doing it because they care. Treat them as such. The more you look at the big picture and recognize all the good things you have in your life, the less you'll care about how well the flowers match the forks. 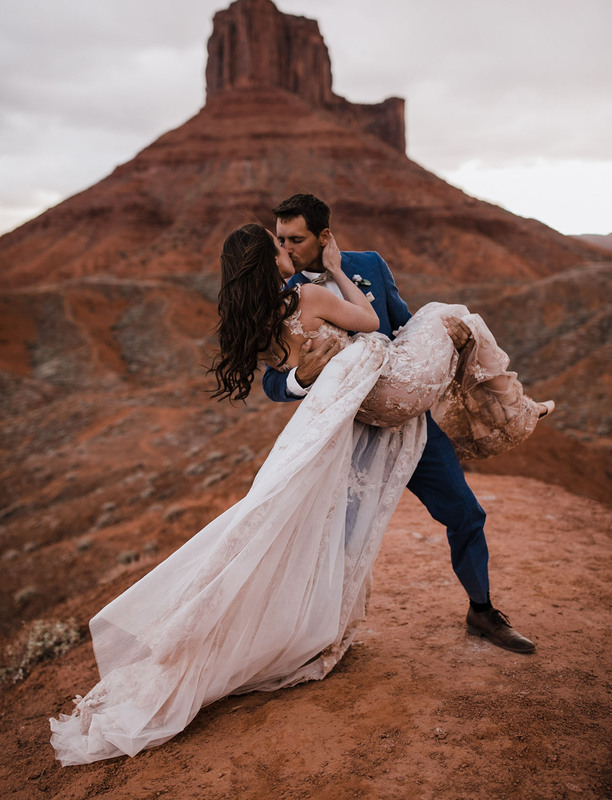 Since we got married in the middle of a canyon, if it rained or snowed (which is very likely in the middle of the desert in Utah in November), it wasn’t like we could just throw a tent up over our wedding… Everything I planned (for the entire year prior) had to be “weather pending,” and we would update our guests in the week before if we had to move the wedding to a day or two before or after. From there, all we could do was just hope it wouldn’t rain for an entire week straight. But we had good weather for the past three years at the festival, so we were optimistic. As dangerous as this all looks, safety is our number one priority, and the net is EXTREMELY strong. The outer frame of the spacenet is made of 3/4″ amsteel (of which the average breaking strength is 64,400 lbs). We embedded dynamometers into the system on each anchor point to consistently measure the tension put on each anchor. At any time, even with 10 people on the net, we were’t putting more than 3000 lbs of force on each anchor. 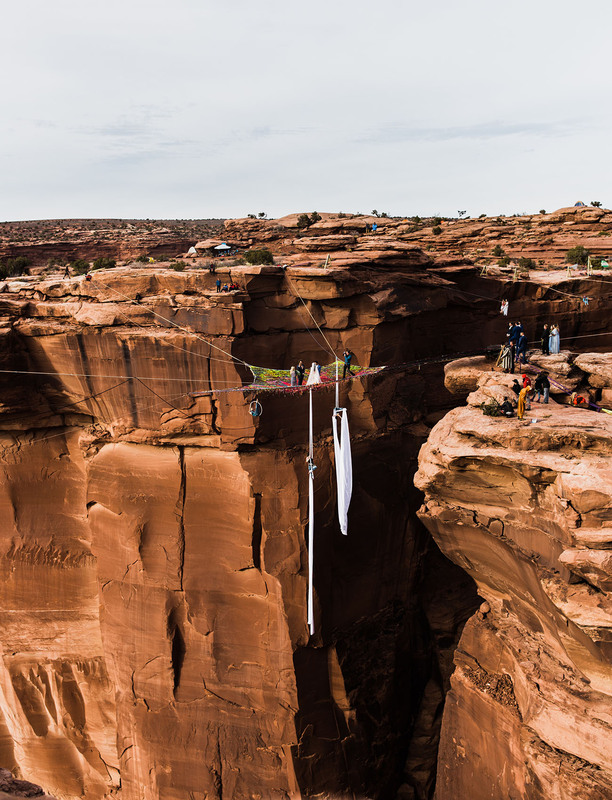 Everyone on the net, including the aerialists below, were leashed in some way with a PAS (personal anchor system) in case a leg were to blow (which is EXTREMELY unlikely, but we like to think of all scenarios for rescue situations). If a leg were to blow, there are still 4 other legs holding it, so as long as you are harnessed in, you would be able to be rescued or get yourself off the net. We’re super conscious about the environment, and made sure we didn’t leave any litter behind. After the ceremony, our friend rappelled into the canyon and retrieved any dropped gear plus other people’s belongings and trash that had fallen off the cliff into the canyon. 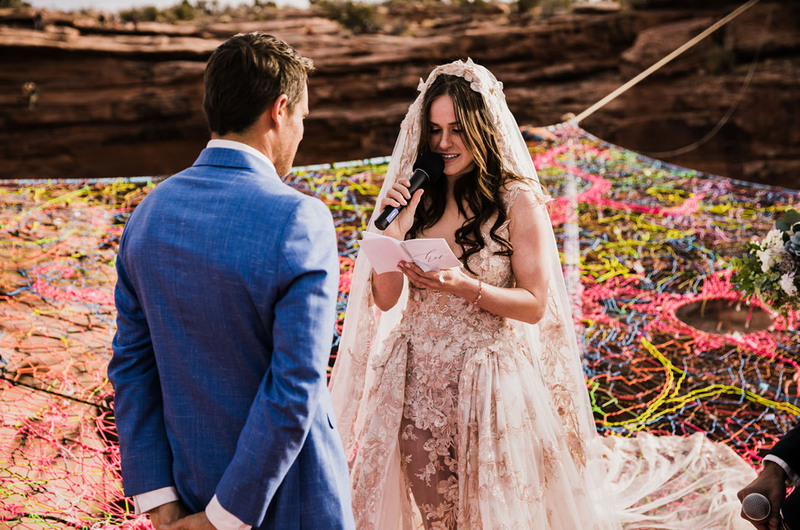 We’ve told you before + we’ll tell you again — you can totally + completely craft a wedding to be as unique as your relationship… And Kim + Ryan’s big day is proof of that! Congrats you two + to many more adventures! Want to see the day in action? Check out the footage from Scott Rogers! This is crazy and beautiful! Love it. Wow! 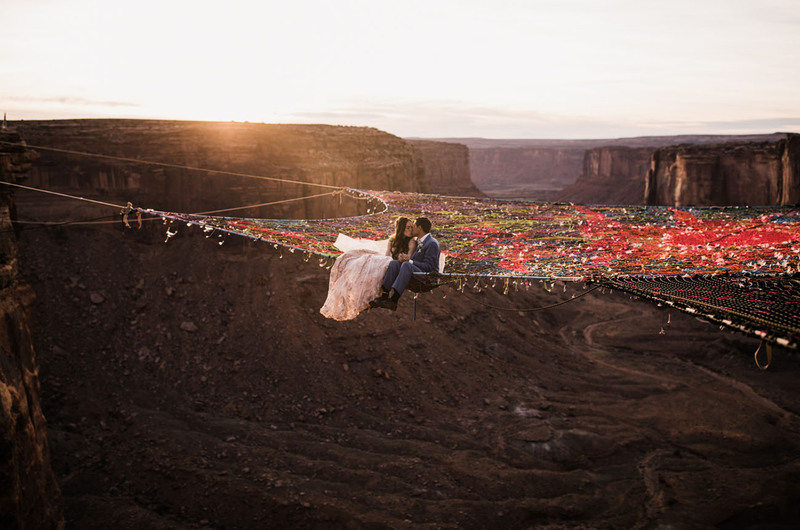 that is one amazing wedding! I thought I’d seen everything but that has just topped it all! Wow, that is very wild! My jaw is on the floor – WHAT?!?!? How did they ever think of this?! AMAZING – every last detail is simply amazing. God, with my vertigo I could never be even close to that. If I had to be their wedding photographer I’d get the biggest zoom possible!! Anyway, it looks AMAZING! 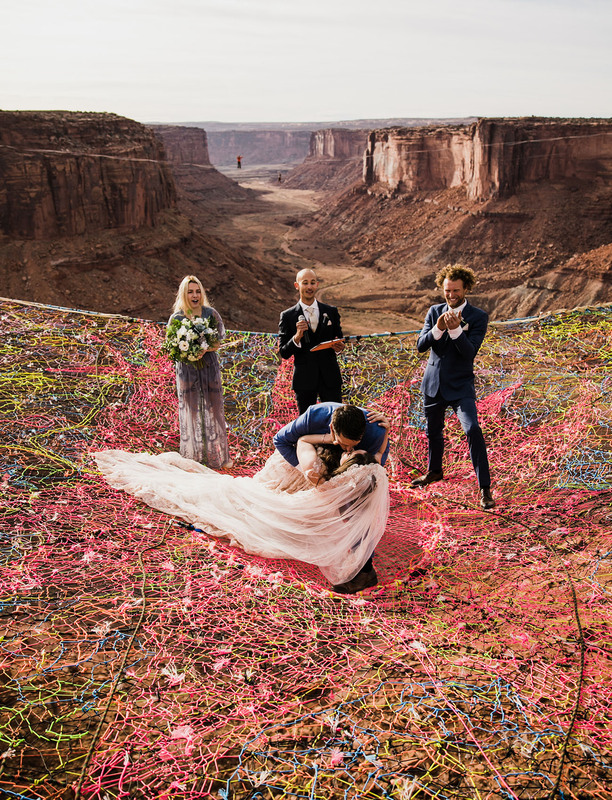 Congratulations to the happy and not-vertiginous-at-all couple! Great pictures! Yeah not so sure I could do this one ..
Congratulations to Kim and Ryan!!! 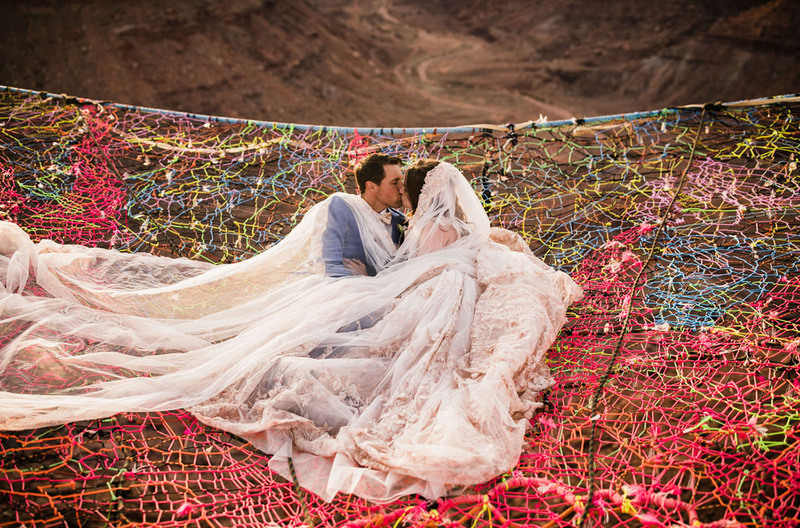 This is the most unique wedding I have ever seen and I love it. Bride and Groom are so brave! Their photographer’s style is amazing. The pictures turned out perfect. It’s definitely one wedding whose pictures I will never forget in addition to my March 2017 wedding of course ;). 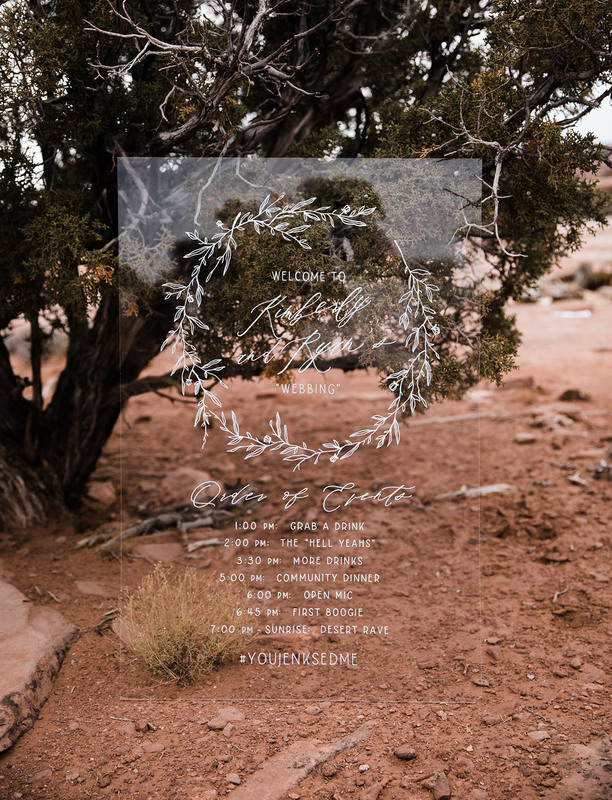 These images were done so beautifully such a beautiful location and cool bride and groom!